8 of 10. A gripping storyline, excellent characters, and some unexpected twists. Not quite as good as I wanted it to be, but still worth reading. My favorite kind of fantasy is normally urban fantasy – the kind where magic occurs in the real, normal world. For me, it’s usually far more interesting to watch how a completely ordinary person deals with magic when it starts happening in their decidedly non-magical life. Impossible is just that kind of book and is perhaps more focused than any book I can remember reading on the mental dichotomy such circumstances would create for a person. Lucy Scarborough is seventeen and has been raised by a charming set of foster parents (Leo and Soledad) since her mother is certifiably crazy and has been since Lucy’s birth. Since passing her off to Leo and Soledad, Lucy’s mother, Miranda, has been living on the streets, appearing in Lucy’s life every few months or years and then disappearing just as suddenly. The only real thing she’s ever gotten from her mother is a song – the popular Scarborough Fair folk tune – which describes a woman cursed to complete three impossible tasks. Lucy discovers that it’s not just a song, but a song about her family. Generations ago, her ancestor spurned the Elfin Knight’s advances and he set her these three impossible tasks listed in the song (make a seamless shirt without needles, find an acre of land with sea on both sides, and then plow the acre with only a goat horn and plant it with a single piece of corn). If she didn’t complete them, she’ll go mad upon the birth of her daughter and the tasks will fall to the daughter. No Scarborough woman has succeeded though, most recently with Miranda who obviously has fallen mad, and when Lucy finds herself pregnant also, she doesn’t dare not take this curse seriously. If she can accomplish these seemingly impossible tasks before her daughter is born, she can break the curse and save herself and her daughter from the fate of their ancestors. Lucy has a few things on her side, most notably her foster parents who, although a little skeptical, are willing to take any measures to help her complete these tasks, and Zach, the boy who grew up next door to Lucy and now is back from college for the summer and ready to give any assistance Lucy will let him offer. Lucy is extremely likable and reacts much how I think many people would to such discoveries. On the one hand, her practical side is screaming how insane this whole thing is and that the best course of action is to just ignore it; on the other hand, how can you risk your life and sanity on the hope that it isn’t real when so many things point to it being all too real? When you’ve watched your mother live for the last 18 years as a complete nut, how do you not take it seriously? The third person narration lets you hear what many of the main characters are thinking and feeling about different developments in the storyline and I really enjoyed this. Sometimes it doesn’t work that well, but for this story, a story that is so focused on the character development, it was perfect. I really think the strongest part of this book is not the magical tasks or the curse, but the relationship between Zach and Lucy. It doesn’t have the same sort of relationship drama that so many love stories have – there is no storming off or misunderstanding or sulky and hurt feelings. The curse provides the drama, so their relationship, growing from childhood friendship to love, gets to be the stabilizing factor in the story and that is both unusual and charming. At one point, when Zach is struggling with Lucy’s pregnancy and she tells him to either be her friend or to just leave (“don’t let the door hit you on the way out,” she tells him), he doesn’t slink off to think for a while about it. He steps right up to the plate and promises her he’ll be the kind of friend she can depend on. And he does. This book was well-written and easy to get into, but I found myself thinking occasionally that it wasn’t quite as good as I wanted it to be. It was terrific, yes, but not mind-blowingly fantastic, if that makes sense. Nancy Werlin is coming to the TLA conference later this month, so I’m excited to get to hear her speak. 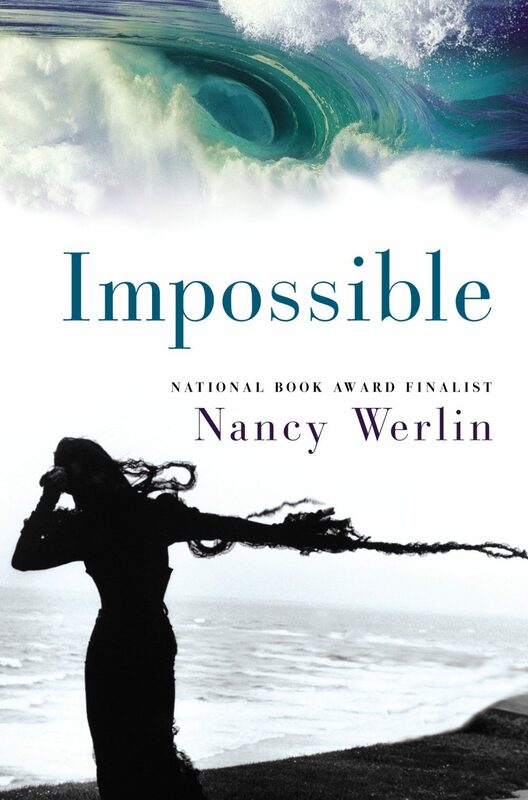 I’ll definitely be looking for more of her books, since Impossible was an excellent read. You know, I read her other book, The Rules of Survival, and I did not like it. Maybe it has made me biased against her stuff, but I had no interest in reading this one. Until your recommendation! Maybe I’ll check it out. I really like that kind of fantasy. Good review. Just enough detail to make me want to check it out. I can’t seem to locate my library card (Tyler likes to swipe it through drawer openings, etc., as though he is swiping a credit card, so it could be anywhere), but I did check the hold list at the local library and there are only 9 holds! Only 9! Not 29! So maybe I can’t wait around to read this one. This sounds really good. I’m adding it to my list now! See…I thought it was good, but not terrific! It felt like it didn’t live up to its potential to me. But I’m glad you enjoyed it! I love reading your reviews. I wish I could write book reviews as good as yours. I’ve seen this around but I never realized it had such a cool premise. I want to read this now! Have you read Enchanted Inc. by Shanna Swendson? It’s great urban fantasy.